Splashdown for the Lynn ferry is scheduled for 2015 but Economic Development and Industrial Corporation Executive Director James Cowdell is working to bring it ashore one year ahead of schedule. The ferry project is nearly five years in the making. Phase III will be completed in the spring. “Everything will be ready but the boat,” Cowdell said. Phase I of the ferry project was completed in 2008 when EDIC rebuilt the boat ramp at the end of Blossom Street extension, tore down an decrepit bait shop, upgraded the drainage and put down new asphalt for the driveway. 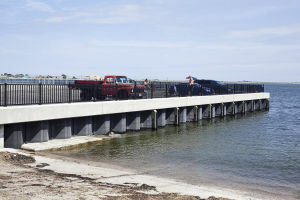 Phase II followed, wrapping in 2012, when a new steel bulkhead was installed to protect the shoreline and at the same time expanded waterfront access from 60 feet to 150 feet. In June of 2012, the Seaport Advisory Council handed over a check for $3.2 million which funded Phase III, dredging, the installation of a 60-foot wave attenuator and a new pier coupled with upland improvements like sidewalks, striping and lighting. Cowdell said he would like to have a bid ready to go out for a boat and an operator by the time the dock work and other projects are finalized. There are two ways the city could go in terms of an operator. Salem owns its own ferry, but other communities contract with an operator and vessel. Cowdell said Lynn has chosen the latter scenario. To date, $6 million has been spent of the project, funded through Seaport Advisory Council. “We’re still looking for federal and state money to build a two-story terminal,” Cowdell said. The first floor of the terminal will cater to commuters with places to purchase tickets, coffee and a paper, while the plan for the second floor is a restaurant with water views, Cowdell said. Cowdell stressed that he is simply shooting to get a ferry in the water by 2014, and it is far from a done deal.